DeliciousCinnamon is the self-proclaimed "group of friends that plays vido games together". Starting out with YouTube videos, the group gained popularity with their playthrough of a badly translated Pokémon Crystal Version-ROM dubbed Vietnamese Crystal in early 2011. Adding livestreams to their content-catalog at the beginning of 2012, they we're making heavy usage of viewer interaction. 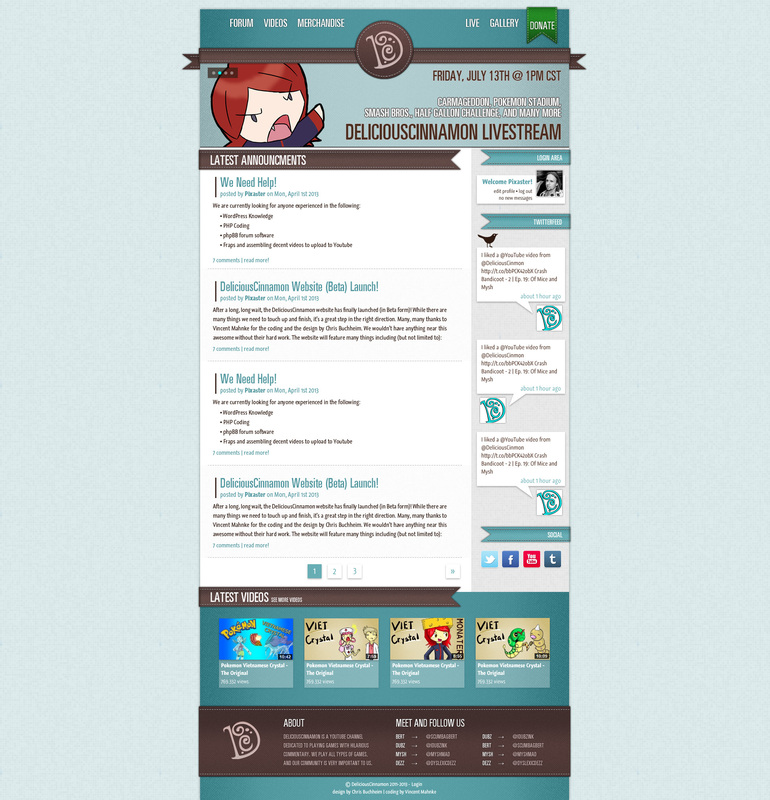 With the launch of their official website, DeliciousCinnamon.com, in 2012 and rebranding in 2013, they enabled their community to further take part in events or directly interact with the crew using game servers, fan-art galaries, and twitch-integrations. Being early-adopters of smashcast.tv (formerly hitbox.tv) and their particular selection of games played on-air, earned them a creative and engaging community across the globe. Being a sideproject for most members of the active team, the project has been put on ice in 2016. Sole web developer for DeliciousCinnamon, I was responsible for building and maintaining their official website and all associated services in coorperation with user interface designer Chris Buchheim. 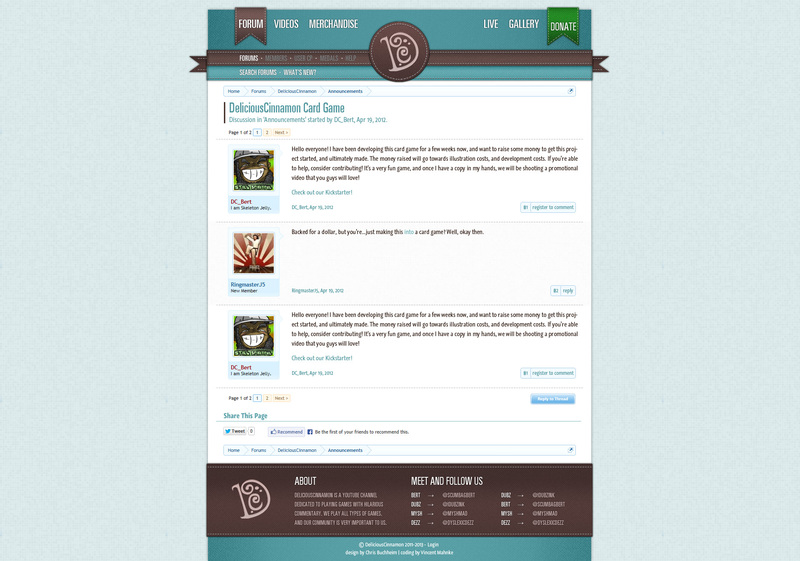 The initial launch of DeliciousCinnamon.com was based on WordPress using a custom theme and plugins built from scratch to enable various game- and platform-interfaces. 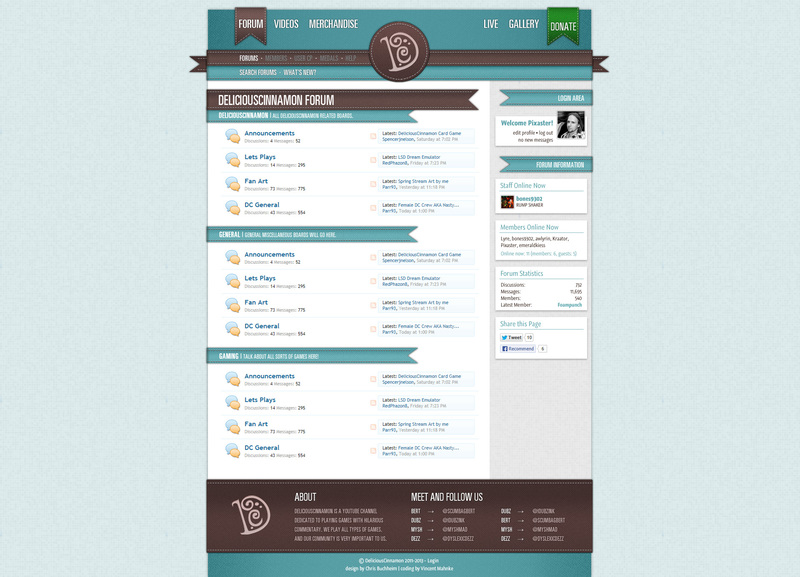 In 2013, I've had the chance to work on a homebrew PHP-framework and use it for the website's redesign. This included building the user-account-bridge to xenForo, a caching system, administrative access for the editorial and various user-driven content managers. The framework was built to fully utilize user-accounts already present from xenForo and reduce development and maintenance overhead. Built modular and with content automation in mind, the framework created less overhead for the editoral staff and easier integration of various game- and platform-APIs (Minecraft, PayPal, Twitch, etc.). Performance for custom-built parts of the website, like the fan-art gallery or donation-interface, both hooked up to a twitch- (and later smashcast/hitbox)-bot, was also increased. Moving the few required content mangement-tools to xenForo, allowed content-management through forum posts and updating the website became second nature to the team.